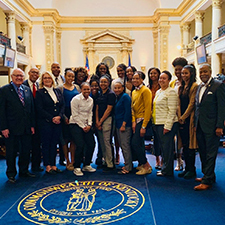 The Kentucky State University women’s basketball team was recognized by the Kentucky General Assembly in the Senate and House chambers for the team’s advancement to the championship game in the Southern Intercollegiate Athletic Conference (SIAC) March 2. Senate Resolution 185 and House Resolution 235 recognized the team for their many wins both on and off of the court. Senior Brooke Wallace and sophomore Erica Jones were recognized for receiving SIAC All-Tournament Team honors. Wallace, who was also honored for receiving second team All–Conference honors, led the team with 14 points and 14 rebounds in the championship game, averaging 11.8 points and 11.3 rebounds during the tournament. Wallace is on track to become the third Kentucky State University women’s basketball player to sign a professional basketball contract. Etienne Thomas, Kentucky State’s director of athletics, was beyond pleased to see the team recognized for its performance this season on the chamber floors. Head coach Terrance Slater was applauded for his leadership capabilities in leading the team, specifically in academics. In the 2016-2017 school year, the team recorded the highest-grade point average (GPA) within the athletics department, totaling 3.35 in the fall and 3.54 in the spring. Last semester, the Thorobrettes recorded a 3.496 GPA, once again achieving the highest average within the athletics department. Three of the student athletes, Wallace, Jessie Key and Amani Williams, finished the semester with perfect 4.0 GPAs. Under Slater’s leadership the program has maintained a 100 percent graduation rate.